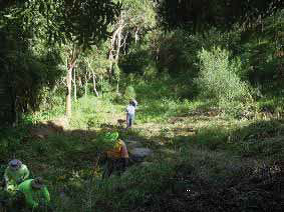 On the Cardiff Heights ridgeline, this steep site has been partially cleared of Lantana and Blue Morning Glory by the Landcare group,Green Team and Bush Regeneration Team. In the drier parts of the site some mulch has been spread and appropriate native plants have been installed with some natural plant regeneration now occurring. The group's work is supplemented by periodic GreenTeam visits to conduct secondary weeding and planting operations. The Landcare Team Leader Jenny says “having the green team come really helps to motivate both myself and the group and stops me getting overwhelmed”.